Graduates from any stream with a minimum of 55% marks or equivalent CGPA in any discipline from a recognized University are eligible to apply. If you are appearing for your final year of graduation in 2017, you are also eligible to apply for ABYB program 2017-18. In such cases, the proof of your aggregate score of min 55% marks or equivalent CGPA in Graduation will have to be submitted within first semester(before start of End Term exams) of your ABYB course to the college authorities. The admission offer will be provisional and will stand cancelled if you do not fulfill the eligibility criteria. 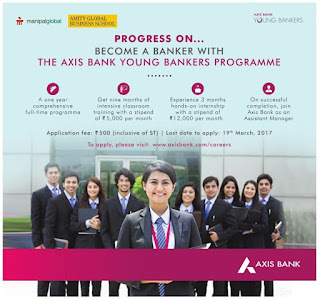 On successful completion of the course the student would be absorbed in the role of 'Customer Service Officer' at Assistant Manager in the Bank with a gross CTC (cost to company) of Rs. 4.12 lakhs per annum (This is inclusive of Loan benefits and Indicative Performance linked Bonus plus Retrials).